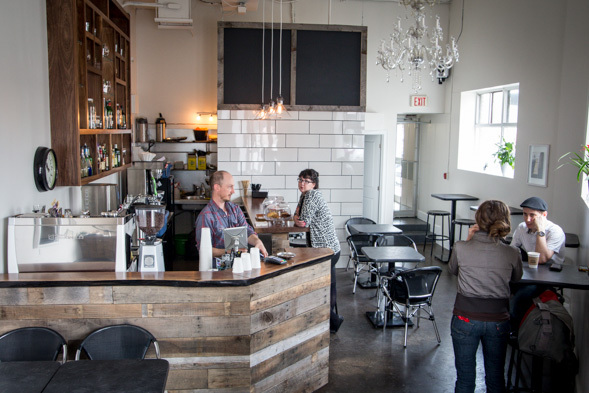 Dundas and Carlaw took over from the old Lolabar space at; you guessed it, Dundas and Carlaw. The space has been transformed with white subway tiles, vaulted ceilings with chandeliers, a wooden bar, and several black two-top tables for grabbing a perch. It is part cafĂŠ, part bar, open from 7am until late, with further food options still to come. 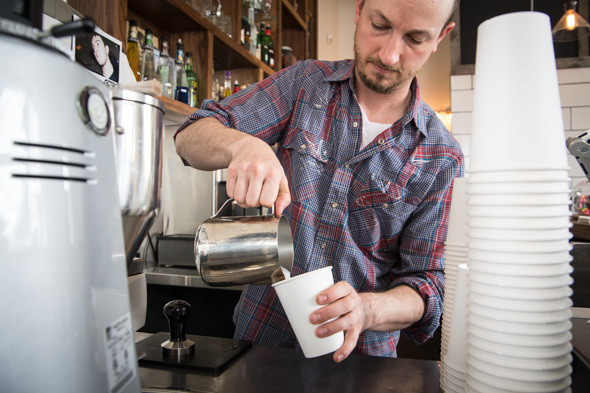 Whether you find yourself chatting up the daytime barista, or the nighttime bartenders, you'll find staff amiable and charming, with answers to your questions. Stop in early for a coffee and a snack, use the wifi do to a little work or get some sun outside on the large patio. They use Rufino beans on an Aurelia II machine, making up a simple and nice Americano that's a steal for $2. Not much for coffee? There's Numi or Mighty Leaf teas, pop or bottled juice. 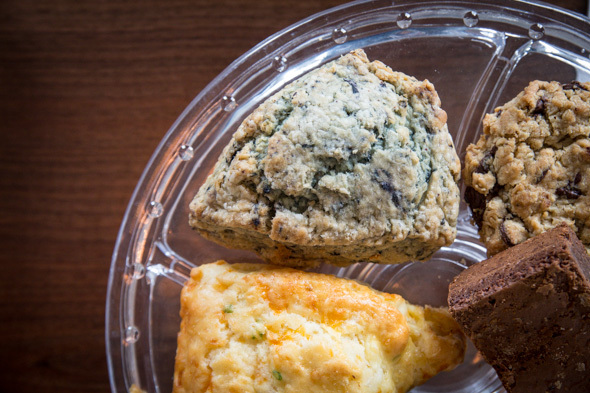 Baked goods are brought in and cover basics-blueberry and cheese scones, muffins and a couple types of cookies, including chocolate chip. The best feature is that night or day, the patio is amazing. It makes for a great transition into an evening of cocktails. 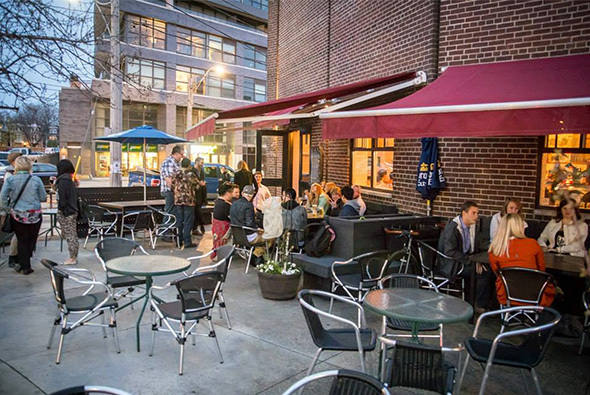 I stopped by one warm night and sampled some of their featured cocktails, a beer and pink lemonade with a dot of grenadine that's like a primo shady- refreshing and great for the sun ($9.25). Pints (Rolling Rock, Liberty Village are two of ones on currently) are $7 and they have the usual collection of bottles and bar rail. Their twist on the Caesar is a totally macked out version that comes as a double with a stacked skewer looming over top for $14.25. The skewer has a huge dill pickle, a pepperette, several olives and a dilly bean which makes it more of a meal than a drink. As soon as one of these impressive drinks would come out of the bar to the patio, it would catch the eyes of new customers, until the whole patio was full of these towering Sleazers on every table. As stated, a full menu is set in the coming weeks, but if the barbecue I spot is any indication, there's more than just drink action promised for the patio. 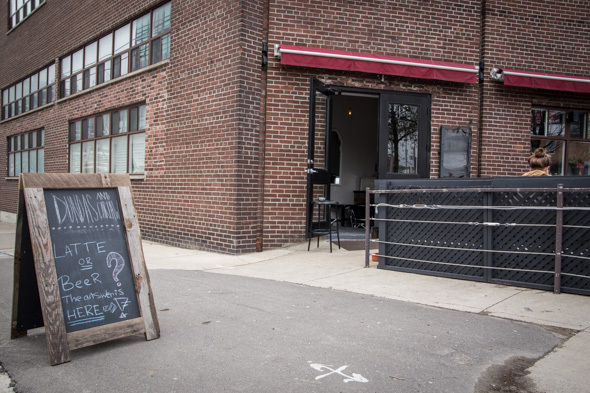 While it's a little noise with all the construction and development in the area, the people who eventually move into the neighbourhood will be thankful to have a hangout like Dundas and Carlaw set and ready to go. I suggest getting in now, while there is still room.